Some artists work with paint, others with clay or stone. The medium of choice for Jenifer Green and Susan Riesen is wax. Co-founders of GreenTree Home, Jenifer and Susan create sculptural candles using 100% pure beeswax and natural cotton wicks. The handmade candles are distinctive for their rich colors and nature-inspired designs. The Twig candles, which Jenifer and Susan cast from an elderberry branch, are beautifully textured tapers, and the Wee Pine Cones and Jumbo Cones capture the rustic, overlapping scales of pine cones. Beeswax burns clean and slow, so each GreenTree Home candle can be enjoyed for hours. There’s no added scent, just the natural aroma of pure beeswax (a renewable resource). If you’re looking for a unique hostess or holiday gift, GreenTree Home’s candles, hand-poured in Delhi, New York, are a natural fit for any home. Greetings from GreenTree Home Candle; coming to you from the foothills of the Catskill Mountains in New York State. I am Jenifer Green, owner and Queen Bee of Sales and Marketing. 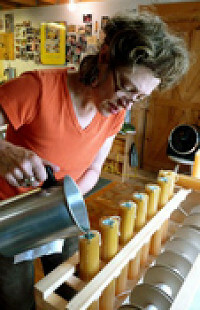 I am thrilled to share our story of designing and producing our 100% pure beeswax candles with you today. 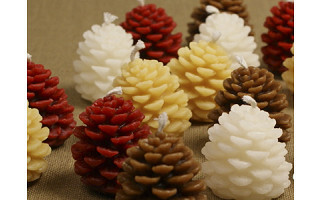 Thank you Daily Grommet for featuring our Jumbo Pine Cones, Wee Pine Cones and Twig candles. With this collection, we embrace the beauty found in nature. 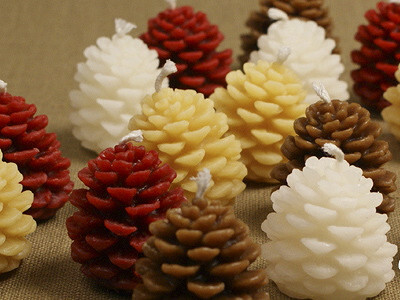 From the detailed petals of the Jumbo Pine Cones to the lush surface of the Elderberry Twig Candles. The Woodland Series is centered on the abundance of shapes, colors and textures found in nature. Our candles center on the comfort of time spent at home, with family and friends. Burning our candles produces a beautiful glowing light and emits an ever so slight, sweet scent of honey. I hope you enjoy our story and candle collections. I welcome your questions and comments and look forward to chatting with you. Really lovely ........and the bee's wax is just so perfect for this. Wonderful product. apparently created with love and care. Thanks Jessica. I could not agree more. We love what we do and enjoy sharing our work with others. It is rewarding to hear your comments. They are also so delightfull looking. What are the heights of the various candles cones and twigs? Hi and thanks for your question. The Jumbo Cones are 5 inches in high and 3 1/4 inches in diameter. The Wee Cones are just shy of 2 inches in height and 1 3/4 inches in diameter. Twig Candles are 12" high. I checked out your web site and would LOVE some of the bottles, too. Where can I get them? @Gail: Thank you for your interest. We'll be in touch directly with the info. Some artists work with paint, others with clay or stone. The medium of choice for Jenifer Green and Susan Riesen is wax. Co-founders of GreenTree Home, Jenifer and Susan create sculptural candles using 100% pure beeswax and natural cotton wicks. The handmade candles are distinctive for their rich colors and nature-inspired designs. The Twig candles, which Jenifer and Susan cast from an elderberry branch, are beautifully textured tapers, and the Wee Pine Cones and Jumbo Cones capture the rustic, overlapping scales of pine cones.